The MayoClinicDiet bills itself as a “diet for life” rather than a quick fix. It attempted to change the way you live, building healthy eating and light exercise into your lifestyle. You don’t count calories, rather you just eat reasonable portions of healthier options and try to be mindful of your body. If that sounds a bit wishy washy, don’t worry. The Mayo Clinic Diet is actually a professional set up, with experts developing the meal plans and workout schedules. This isn’t about starving yourself, it’s about eating well and staying nutritionally balanced, moving your body a bit more to help keep your muscles working, and tracking your habits to help change them. Tracking your habits, rather than calories, is an interesting idea. The point is that you can then identify particular triggers for poor eating choices or times when you give up on exercising. Once you know what those triggers are, you can begin to challenge and change them. So, this is very much a psychological system, as well as a practical “don’t eat that” way of doing things. The diet isn’t expensive, at $4-5 per week (the site quotes two different amounts! )This is not much at all, but at the same time we’re not completely sure how much you truly get for your money. Some of the tips are personalized, which would go some way to explaining the cost, but otherwise much of the information seems to just be healthy recipes and exercises, which you can find for free elsewhere. MayoClinic.org isn’t all that easy to navigate at times, either, and you’ll find yourself having to search around for information. However, you can easily build a free diet profile, which takes into account your ideal weight and how long that might take to achieve. 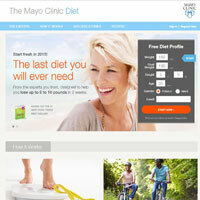 To be fair to the Mayo Clinic Diet, they provide an iPhone app, plus some tracking tools for your height and weight. You won’t find these everywhere, and we do like the “change your thinking” approach to dieting. This isn’t an instant weight loss system where you put it all back on after a quick fad diet. The aim is to lose weight, feel healthier, and maintain that. We encourage you to give the free 7 day trial a shot. If you like what’s happening and what you see, the diet isn’t expensive. From there you can decide whether you need to keep up a subscription in the long-term or whether you understand the diet well enough to continue on your own.